Hollywood, Fla. September 24th, 2018 – First Choice Background Screening, the premier provider of background screening, today announced its newly re-designed website www.firstchoicebackground.com. The company prides itself on providing criminal history, credit and verification reports, and other employment screening services for education, government, military, healthcare, as well as many other industries throughout the United States and globally. “We are excited to further show our customers what First Choice has to offer, as an extension of their HR and Compliance Department,” says Executive Director of First Choice Background Screening, Nicole Roedel. “Our website will help streamline our customers and make it easier to gain new information on our company.” Ms. Roedel further stated. First Choice provides the tools necessary to hire the precise candidate every time. Expertise and unique specialization in the research of on-site public records offer the assurance applicants hired are who they claim. First Choice is easy, economical, fast, reliable, and the best defense against negligent hiring lawsuits, employee fraud, and application exaggeration. First Choice offers a full range of employment and tenant screening products and services, through state-of-the-art technology and is well positioned to meet the employment needs of all the customers they serve. Their product and services provide precise information, tailored to meet individual corporate preferences and while focusing on compliance. Timeliness and accuracy provide a competitive advantage in the background screening industry for First Choice. The company specializes in the most professional and comprehensive pre-employment screening services, increasing retention rates and overall employee quality. Every stage in the screening process ensures companies receive correct and compliant information. First Choice Background Screening is a leading provider of pre-employment and tenant background screening services and the information needed to make accurate hiring/placement decisions. With more than 25 years of professional experience in the research of on-site public records, First Choice strives to be an extension of their customer’s HR and Compliance Department, as a partner. 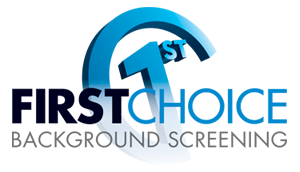 First Choice Background is headquartered in Hollywood, FL.